Unless we announce otherwise, our normal meeting place will be the Lecture Theatre in Neptune Court at the National Maritime Museum, Greenwich, London SE10 9NF. On arrival please give your name to the staff member checking the register at the door. Please refer to the map above and/or click here for a zoomable map. For more information about public transport to Greenwich, please see the RMG website ‘How to get here’ page. Please use the Romney Road entrance to the Museum — that is the old main entrance facing the Romney Road (see above) letting directly into Neptune Court. 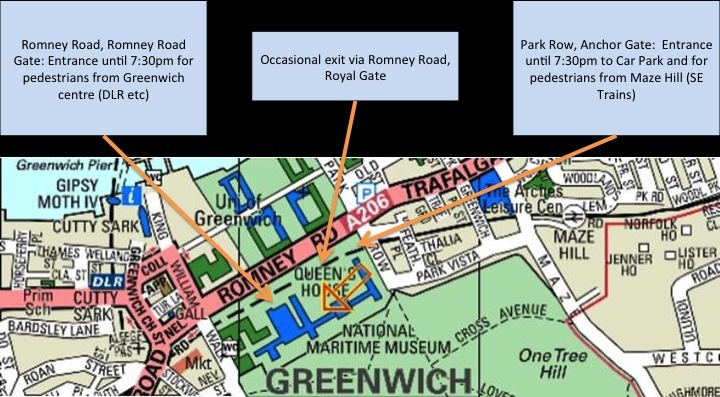 For members walking from Greenwich centre from the DLR etc., until 7:30pm the Romney Road Gate (first gate on Romney Road), will be open. For members coming by car, on meeting evenings you may park free in the RMG East Wing staff car park. Until 7:30pm the car park entrance “Anchor Gate”, which opens out into Park Row at the north-east corner of the site (first gate on the right coming south down Park Row from Romney Road) will be open. This gate can also be used by members walking from Maze Hill mainline station — one stop after Greenwich. Please tell the Security Officer at the gate you are coming to the Flamsteed meeting. After parking your car please walk down passing in front of the Queen’s House to the Museum entrance into Neptune Court. Car drivers, on leaving at the end of the evening, it may be necessary to use the Royal Gates letting out onto Romney Road opposite the Queen’s House. Walk back to the East Wing car park to collect your cars and the Security Officer will direct you — drive out passing in front of the Queen’s House and down to Romney Road, which is the main road running between the Old Royal Naval College and the museum.